I have heard many times before that the light show in Roppongi is one of the best in Tokyo. This year, I finally made my way there since the opening of Tokyo Midtown. Of course I have been there before but this was the first time that I had gone there during the Christmas season. I tend to avoid going to places like this due to the crowds. I headed there on a weekday evening, so the crowds were not terrible. I was not disappointed as everything exceeded my expectations. Tokyo Midtown is the place to be to see most of the light displays. The main plaza on the first floor has several snowmen. They were plastic renditions, rather than real snowmen, and they tended to look a bit scary overall. There is also a large tree near the entrance to both the shopping centre and the Ritz Carlton. It was one of the biggest trees I saw in Tokyo. Inside Tokyo Midtown, there are only a few things to look at. In the main atriums, they had some ornaments hanging that were very modern looking. They didn’t look like Christmas ornaments of any sort to me as they are traditional Finnish decorations called Himmeli. The first floor did have a great Santa tree. It was a Christmas tree made entirely of Santa ornaments. It was pretty cool and cute at the same time. In the basement, they had a small Christmas market where you could buy many Christmas related things. Thankfully, unlike Tokyo Sky Tree, the items for sale were mainly ornaments or Christmas related items like Christmas cards. Outside of Tokyo Midtown is the main garden. They have converted the large grassland into a massive lighting display with a constant show sponsored by Emirates Airlines. It is an amazing show and I was truly surprised with how good it was. 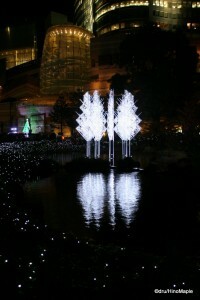 Next to the main event there are several trees that were lit up in the park next to Tokyo Midtown. It makes for a nice, albeit cold, walk. Not to be outdone, Roppongi Hills is also doing their best to attract people. While the lights are not as good, they are still great. 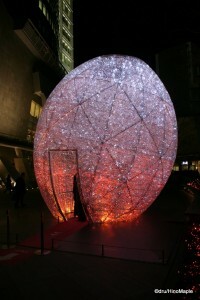 There is a large egg like sculpture in the 66 Plaza called “Velvety Duration”. The 66 Plaza is the famous plaza at the main entrance. The plaza itself is most famous for its sculpture of a giant spider that has been photographed by almost everyone who has visited Roppongi Hills. The egg itself is interesting but nothing to get too excited over. In the Gardens next to the TV Asahi Building, you can see a great “Time of Crystal” sculpture. It is pure white and the reflection off of the pond is great at night. On the Azabu side, behind the TV Asahi building, you will be able to see “Sympathy Moment”. 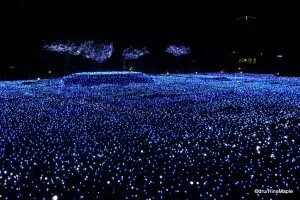 It is a 400m tree lined road that has all of the trees adorned with blue and white lights. It is one of the better displays but the lack of variation again means it gets boring, but it is only 400 metres so you won’t miss much if you don’t venture up or down the street. Each of these light displays has been sponsored by various corporations. “Velvety Duration” is sponsored by Suntory, “Time of Crystal” has been sponsored by Suzuki, and “Sympathy Moment” has been sponsored by Samsung. You can see their products within Roppongi Hills as they are the featured items. They also have the best Christmas Market that I know of in Tokyo. It is an outdoor market making it a little chilly to be there. They have the typical German beer and sausages, but they also have nice ornaments too. It is a nice place to visit but unfortunately they have the typical foreign item mark-up with beer starting at 800 yen and sausages starting at 500 yen a piece. It is a nice treat to have once in a while though, so I hope you can check it out. This entry was posted in Christmas, Tokyo and tagged 66 Plaza, Christmas, Christmas Illumination, Christmas Lights, Christmas Market, Christmas Tree, Hills, Himmeli, Illumination, japan, Midtown, Ritz Carlton, roppongi, Roppongi Hills, Starlight Garden, Sympathy Moment, Time of Crystal, tokyo, Tokyo Midtown, TV Asahi, Velvety Duration by Dru. Bookmark the permalink.